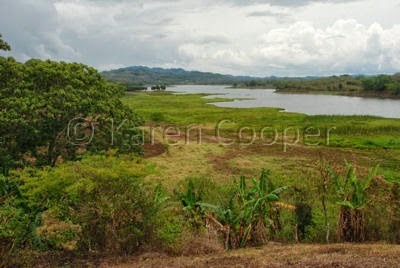 Lake Apanas is located in the department of Jinotega in northern Nicaragua. She is a man made lake formed by damming the Tuma River for electricity. This whole area of Nicargua is pretty spectacular and very off the beaten touristy path. I've heard there are 5 gringos living in Jinotega, and even those 5 don't like socializing with each other. So if you want total cultural immersion and some incredibly warm and hospitable people, this is definitely the place for you. There are a lot of coffee plantations and cattle farms here. The coffee is some of the best I have tasted from anywhere in the world. Earthy and full of life. Like the whole area. It has big skies and big cattle. Impressive lightning displays in the rainy season. And some pretty impressively bad roads. I need to find a dentist to put my fillings back in. But that's the beauty of exploring off the beaten paths of the world. Who needs all the pretty amenities of the soft world we are used to, when you can come here and see some of the most untouched and jaw dropping scenery of Latin America. That I have found so far. Of course, I'm not done exploring yet! Very nice and interesting post again, Karen! While being an ex-pat in Bolivia I too did not like being around Gringos from the USA! (Where I'm from!) Great post! I'm going to Costa Rica next week. I'll keep you posted! Thanks Susanne, fancy, and Jubie. I'll look forward to hearing what you think of Costa Rica, Jubie. It's a beautiful country. Could have picked any picture on this site and given praise. What a talent you have for photgraphy and generousity for sharing it with others. Will pop in regularly to be amazed each time.